This morning saw unusually good seeing for this location. The diffraction pattern of Aldrebaran which I use to collimate with on screen looked almost perfect. 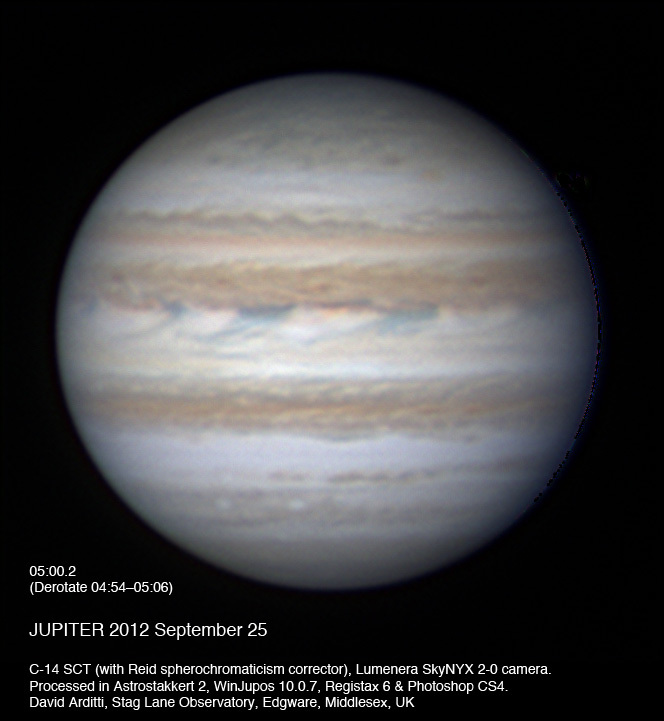 Unfortunately there was cloud as Jupiter culminated at midnight, and it took a long time to move off. The beautiful filigree patterns in the cirrus illuminated by the moonlight, with a rainbow halo around the Moon, showed the stability of the high atmosphere. At 1am the cirrus patterns disappeared and the entire sky fugged over with a mist, but I kept monitoring Jupiter, and it cleared at 01:15 with seeing still good. Here is oval BA rising and WS-Z near the centre of the disk. I only managed to get a single RGB run of 3 mins total (about 3500 frames total) in on this occasion due to cloud, so detail is not great despite fair seeing. 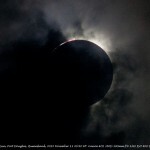 Conditions at Four Mile Beach, Port Douglas, Queensland, Australia were not perfect, with broken cloud throughout this early morning eclipse. However, I have been able to put together this sequence of shots which shows the progress of totality as it appeared from this location. These RAW shots from a Canon DSLR have been processed slightly in Photoshop. 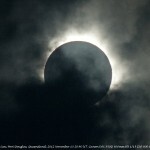 I also have shots of the sunrise and of the partial phases, and videos of stages of the eclipse, which I will probably post later. 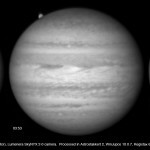 My best image of Jupiter this apparition (and probably ever). RGB,RGB,RGB sequence, all at 1 min 30 fps. 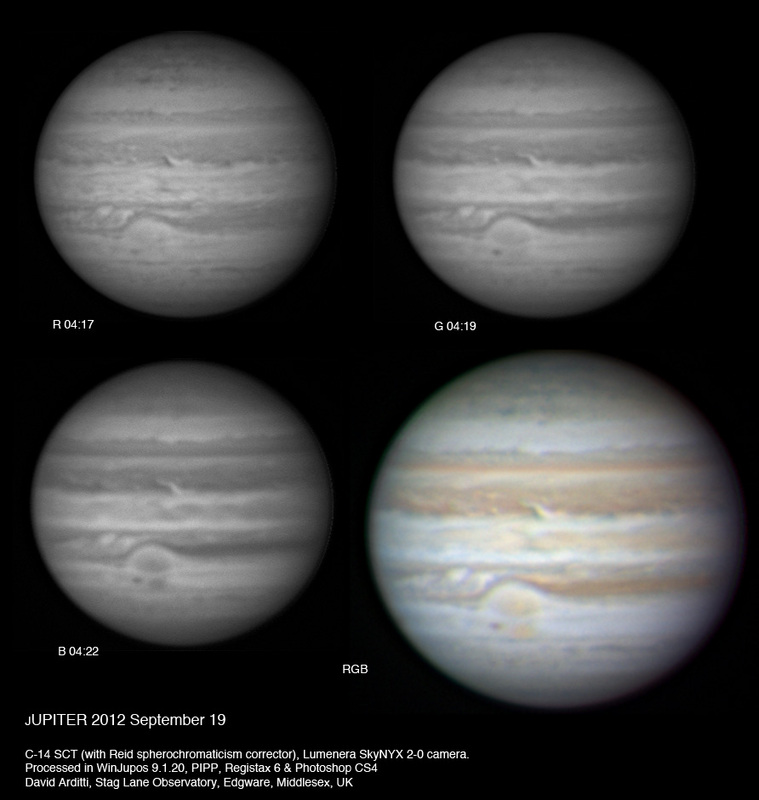 Trying to bring my Jupiter processing a bit more up-to-date. This image from the 14th was constructed from an RGB,RGB,RGB sequence, all one minute videos. Seeing not great. On this date I only managed to get one 60s video through the red filter before it clouded. 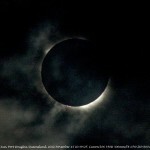 Pity as the seeing was good. Here’s the result. This has been sitting on my desktop for a long time. 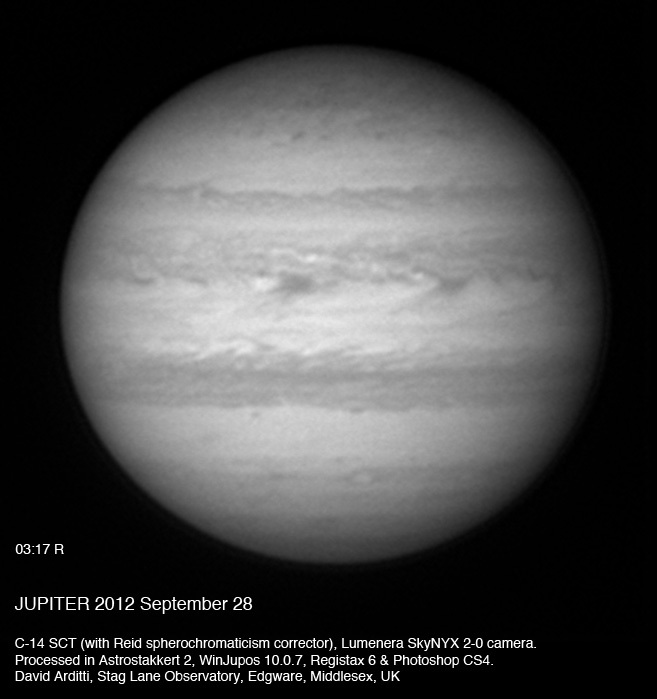 Good conditions (by our standards) on September 25 enabled this capture. 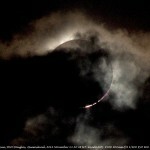 The observatory was opened and the telescope was allowed to stabilse for an hour to ambient temperature. It was then pointed at Aldebardan and the image was focused on the detetector and then defocused by anticlockwise adjustment of the knob to produce a diffraction pattern. The telescope was collimated to perfect the symmetry of the pattern with the star centred on the detector. 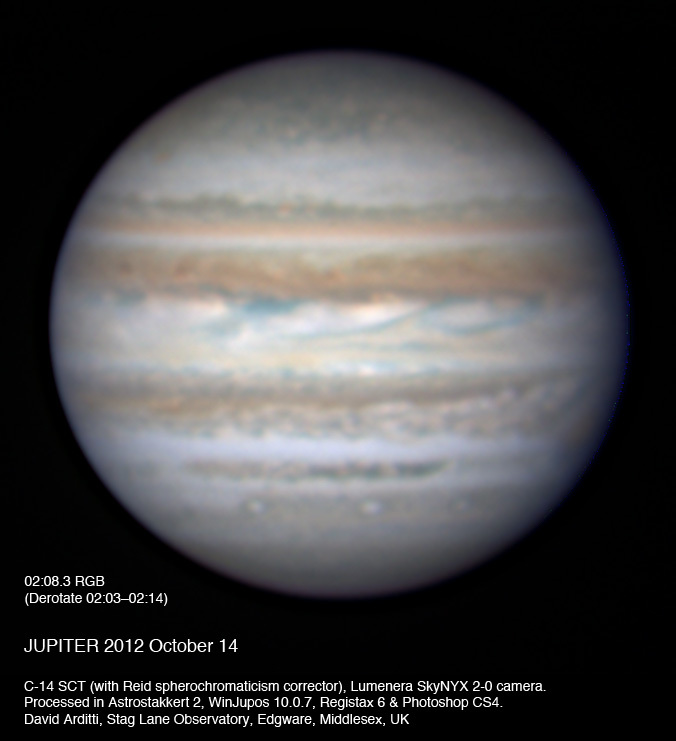 The telescope was then pointed at Jupiter and focused, with the final turn of the focusing knob being anticlockwise. The final focusing was with an electric Crayford focuser. A sequence of one minute videos was taken through filters in the sequence RGB,RGB,RGB,R as quickly as possible, at 30fps. 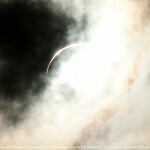 Between each filter, exposure was adjusted to keep the histogram 70% full, but focus was not altered. 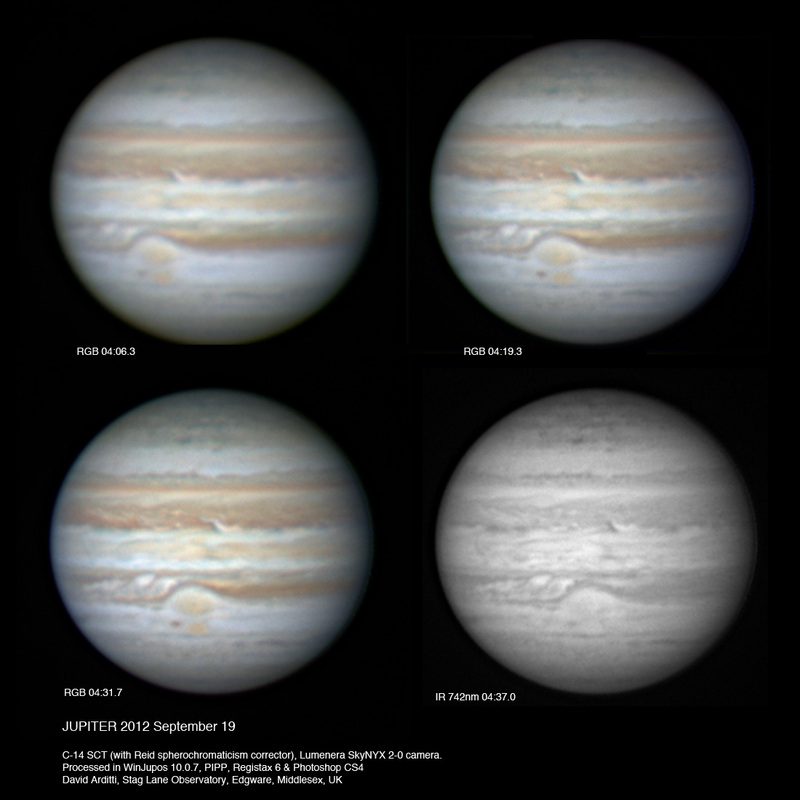 Each video was stacked in Astrostakkert to produce an image. 1.5x drizzle setting was used to get a bigger image. 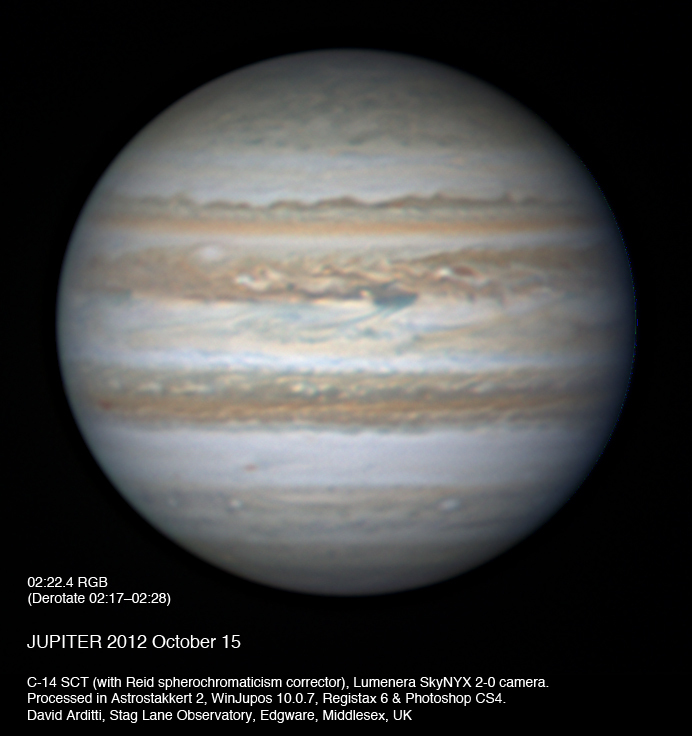 Each image was then wavelet sharpened and re-saved in Registax. Each of these images was then “measured” in WinJUPOS. The measurement files thus produced for all the R images, and all the G images, and all the B images, were then combined using the WinJupos “derotate images” function to produce master R, G and B images for the session. These “master” images were then themselves “measured”. The measurement files produced were then used in the “derotate RGB frames” routine to produce the RGB image (with no Luminance). That image was imported into Photoshop as a 32-bit TIF (on a different computer), sharpened further using an unsharp mask, and optimised for brightness and gamma curve. 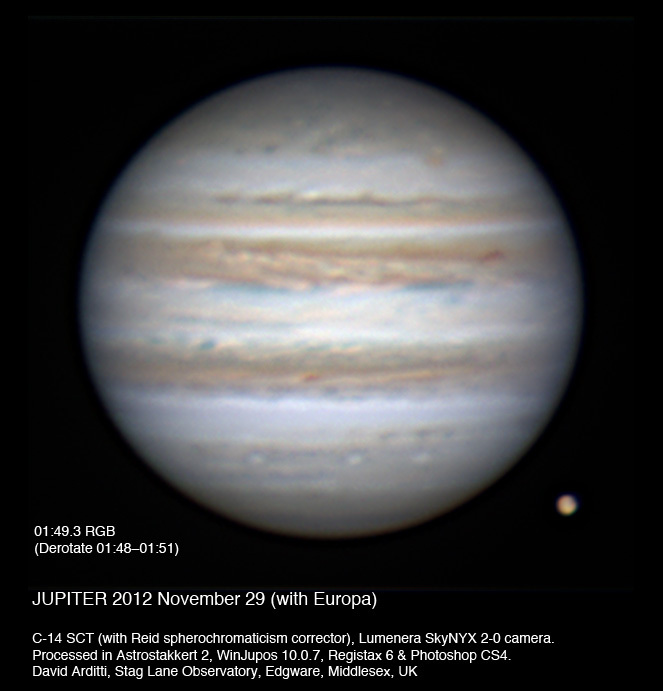 Lastly the observing details were added and the Photoshop file was exported to JPG for posting. 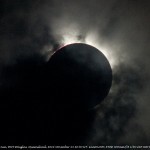 Here’s some images from the 22nd, poor seeing as usual. Ganymede is just coming out of occultation. The 03:56.8 image is made from a single RGB set. A hint of detail is visible on Ganymede. 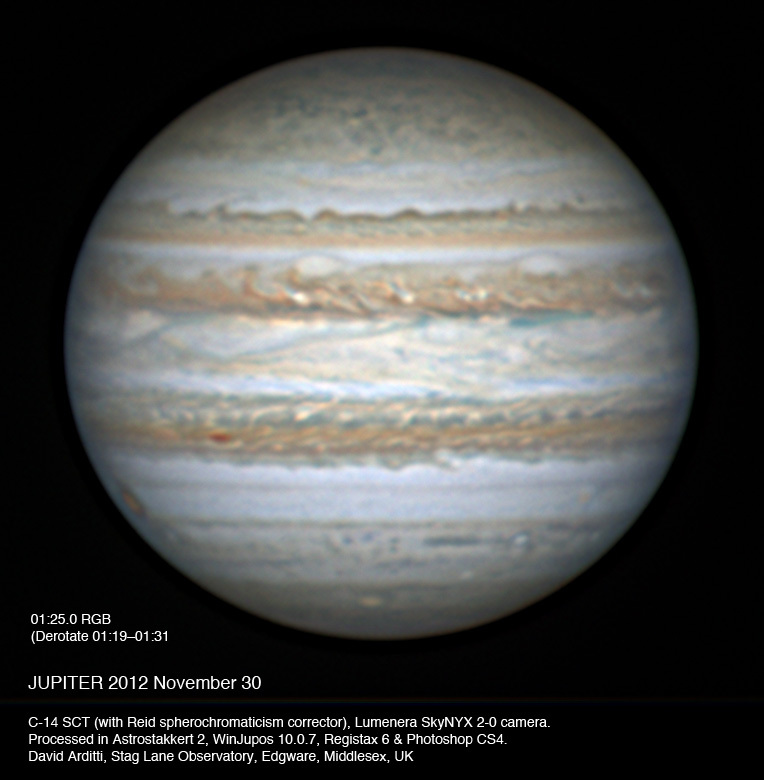 The 03:53.9 image is a merger of three RGB sets using WinJUPOS (technique suggested by Dave T). These cover 03:48 to 04:00, so Ganymede is smeared by its orbital motion. 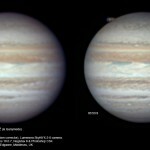 One sees however that a lot of sharpness on Jupiter is gained by the 12 minute merger (and re-sharpening). I also provide the three red images in a separate file. They were produced by 150% drizzle in Astrostakkert 2. These were taken in pretty poor seeing. R,G,B are 90s runs. I also have some IR shots, but haven’t dealt with them yet.